As of late, Pharrell has been slyly previewing a few new adidas collaborations, and today the music and style icon gives us another peak at a never-before-seen colorway of his NMD. The most unique version of the “Human Race” NMD yet, this latest look that we hope will be hitting retail features a multi-color upper with new text running along the uppers: “BODY” and “EARTH”. 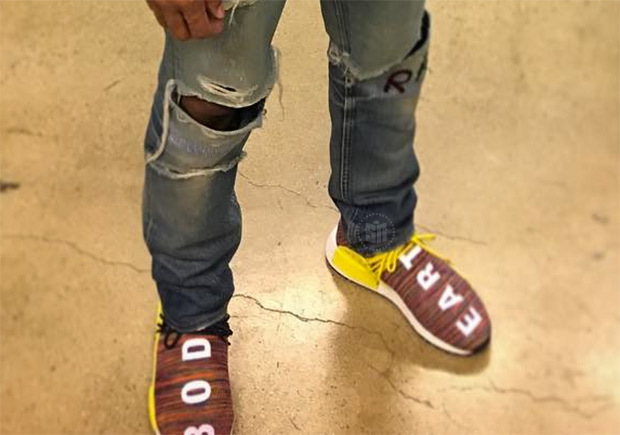 This semi-obscured look is all the info we have on the new Pharrell x adidas NMD colorway he have so far, so stay tuned to sneaker News for further details.